In a time when films and scores are often flashy and soulless, it is a joyous experience to find two gentlemen wanting to revisit a gentler age. One of them, director Todd Haynes was not of the period, but the other, Elmer Bernstein most definitely was. In the film music gentry, I don't think there is a greater figure than Elmer Bernstein. Even the other gentlemen of film music, Williams and Goldsmith, were not writing film scores in the 1950's, but at that time, Elmer Bernstein was cementing his career. For this reason, Todd Haynes felt that only Bernstein would be suitable for his film, what might be described as a fond homage - although more modern in its dealing with some of the themes of race and sexuality - to the melodramas of the time, but instead of a score written in the style of, Haynes has been able to hire the services of someone who has always written in a timeless style whatever the period of the films' production. I was quite tempted to compare Far From Heaven with Pleasantville, both deal with the facade society of the 50's, where everyone goes about their business keeping up a veneer of pleasantness to disguise anything murky or ill feeling. As the mayor in Pleasantville says, everything should be, well, 'pleasant.' However, Pleasantville was broadly speaking a satire, but it did benefit from a superlative Randy Newman score (perhaps the only other person who could have written something as good as Bernstein for this film), but Far From Heaven is a more serious melodrama. As a result, Bernstein's music is more straight laced than Newman's occasionally humorous edge. The opening track, Autumn in Connecticut (a beautiful sight, I assure you) sets the tone; Cynthia Millar's graceful performance of Bernstein's gentle piano led main theme is followed by one of the few surges in orchestral tone and the main theme is performed in all its lush glory. After the opening flourish, the forces are largely smaller in scale, typically strings and woodwind in various combinations, but invariably with the piano weaving in and out. There are the couple of the more bouncy passages that Bernstein invariably includes, notably at the end of the opening track. A little jazz for Cathy and Raymond Dance and Miami is thrown into the mix for a pleasing change of pace. The more dramatic sections are, perhaps surprisingly, given quite an intense low end piano motif, most notably in Back to Basics, although the overall tone is of melancholy, but warmed by the typically sublime and low key orchestration. For all the hype associated with the score, my expectations were perhaps a touch high. It is an absolutely charming score, but I feel to say it is one of Bernstein's best is veering toward hyperbole. I don't know why, but it just didn't click overall in the way his best efforts have done so, scores such as Frankie Starlight and To Kill a Mockingbird just feel that bit more accomplished. There are plenty of fine moments here and it has a deep emotional resonance throughout and shouldn't be passed up. Bernstein's music is almost always at a higher level of quality than most composing for cinema today. It a score that was written with great care and love, something rarely found in the film music written today, this is film music, as it used to be. 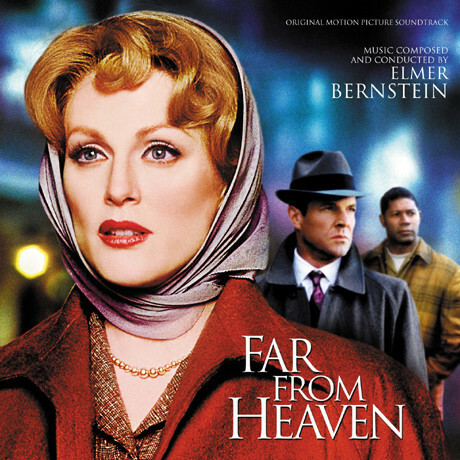 When listening to Elmer Bernstein's score for Far From Heaven it is like time has been standing still for the last fifty years. Bernstein's score for the film, featuring one of Julian Moore's best performances ever, is in the same vein as the large romantic scores from the fifties. The kind of score they just don't normally do today. There's the delicate piano and the lush, dramatic strings. And the occasional cymbal crash. The score has even been mixed to sound like a score from the fifties - the big orchestral swells actually sound a little distorted and fragile. And it works! This is, however, something that is easier to notice when watching the film. It's possible that the soundtrack CD has been given a more traditional and modern sound. In the film, the music is actually a little over the top at times. But not the kind of over the top that makes the viewer cringe, but rather generates a smile of recognition - this is, after all, what many of these old scores sounded like, although perhaps not that obvious and, at times, tongue-in-cheek. So it works, even if some of the more dark and dramatic scenes in the film actually made me smile a little, because of the music. But on CD it works really well. The dramatic, dissonant chord in "Hit" is an excellent pastiche, as is the opening "Autumn in Connecticut", which starts with a delicate piano, presenting the main theme, before the rest of the orchestra joins in. What follows is an excellent and quite lovely score, full of beautiful piano and woodwind solos, layered with moments of orchestral richness, as well as moments of more quiet underscore. The scores slow theme, often performed by piano, backed up by subtle strings (such as in "Evening Rest") is a real beauty and conveys feelings of idyll, but also of loneliness. Berstein's writing for woodwinds also stands out, especially the low flute, backed up by soft strings and piano in "Prowl", as does the scores' jazz elements ("Miami" and, once again, "Prowl") and the more upbeat moments in cues like "Turning Point". But it is the melodramatic moments one remembers afterwards. I can't help but fall in love with the dramatic renditions of the main theme in "Party" and the already mentioned "Autumn in Connecticut". Fifties music from the 21st century at its best. And it's no wonder Bernstein was the one to write it. He was, after all, already working in the business back then. I fully expect this score to get an Academy Award nomination. It truly deserves it.